Create, learn, work, and play like never before. 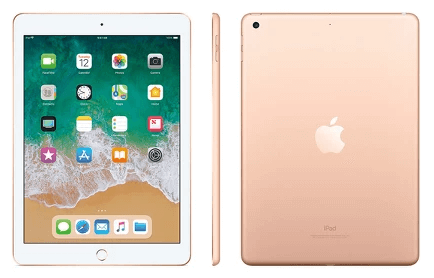 An immersive 9.7-inch Multi-Touch Retina display.1 A10 Fusion chip with the power and capability you’d expect from a computer. Now supports Apple Pencil.2 8MP camera. FaceTime HD camera. Touch ID and Apple Pay.3 Wi-Fi and LTE.4 All-day battery life.5 Over a million apps available on the App Store, including augmented reality experiences. A thin, durable, aluminum design that weighs just a pound. And iOS 11 makes iPad more powerful, personal, and intelligent, so you can do more than ever before. iPad. There’s nothing else quite like it.